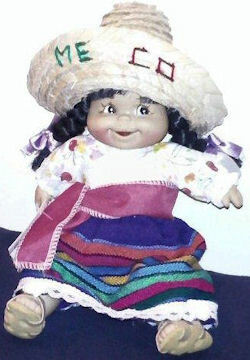 Francesca is looking for an approximately 9 inch tall vinyl doll with black bangs and long pigtails, wearing a colorful Mexican outfit with a print blouse, a bold horizontal stripe skirt, a magenta sash, and a sombrero with Mexico painted on the brim of the hat. She’s wearing tan vinyl sandals. She writes: You have found a Sonja cat for my child about six months ago. Now I search for this doll for my other baby. I have buy in Mexico one doll but I have lost her in airport and my daughter thinks about you to found another similar. Thanks a lot for your lovely attention. I have do immediatly an offer for this e-bay item…end now…. I hope to get it!!!! A lot of thanks also from my baby!!! !